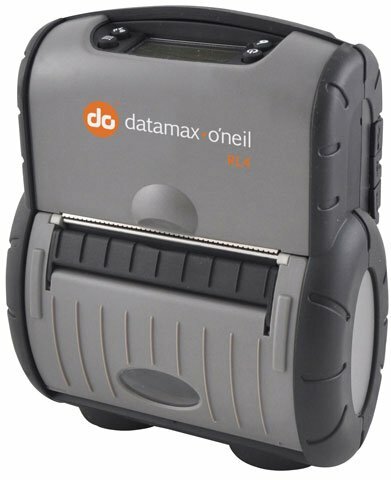 Datamax-O'Neil RL4 - Mobile Direct thermal printing, 4" print width, 203 dpi, 64MB RAM/16MB flash, LCD, RS-232 Serial, USB and Bluetooth interfaces. Includes battery and belt loop. Charger and cables not included. The Datamax-O-Neil RL4 is built to keep pace in a busy warehouse. Labels print quickly and accurately every time, even in cold environments. Downtime is reduced thanks to a large media roll capacity and a battery that stays charged for a full shift. With uncompromising standards, the RL4 endures even the most punishing environments, and passes the MIL-STD 810F drop testing requirements. The RL4 is so rugged it continues to print after 26 consecutive drops to concrete from 6 ft. (1.8m) even when tested at extreme temperature conditions. The versatile RL4 comes with a wide selection of charging and mounting accessories that allow it to be worn on the hip, mounted in a truck or even mounted and powered from a forklift operating system. 4" x 3" Direct thermal paper label. Not perforated. 40 roll case. 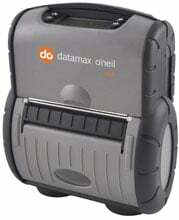 The Datamax-O'Neil H41000-100 is also known as ONE-H41000-100	or H41000100	.